I have read the threads but still have some ??? 1) can I do this by just unbolting the radiator and letting in come/ hang forward or total removal of radiator? 2) can I use the ZX14 gaskets at the head or the C-14 gaskets...the ZX14 pipes are bigger? YES, just reuse them. Although, you will also have people tell you that never works. Has worked every time for me. CAP the left side, OR get a set of zx14 slip-ons and install. You could, but it'd be god awful ugly. It's a shame that the forum changed a while back. 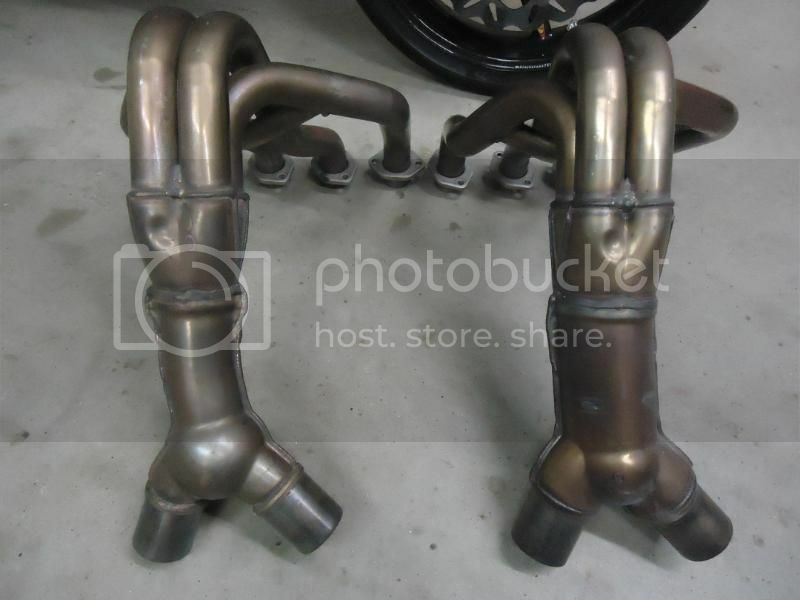 Back when I was active with my '08, I put a set of ZX14 headers on, with a set of Hayabusa pipes. I mated the mid pipes of the Hayabusa to the mid pipes of the ZX. I posted all the details about it and a lot of pics. But all my old posts are gone and everything. Here is a good shot on a road trip from Colorado to Red Lodge Montana. But you can see the pipes here, as well as the step in the mid pipes. Man I loved the sound of those pipes!! But I like it loud. No need to remove the radiator. As you said. Unbolt and let it rest out of the way. The 2006-07 ZX 14 headers are cat-less. Where as the 2008-11 are not. I picked up the latter, and I remember I "had to" cut and gut mine. They don't make it easy to get that crap out of there. I do remember using the original gasket. That's for sure, and no problems. I was never a big fan of the ZX pipes on the Connies. Most metal surfaces on the Connie have a brushed aluminum color/appearance for the most part. And the ZX pipes are just polished tubes. No flair or pizzazz. That's why I went with the Hayabusa pipes, because they had the same brushed/machined look to them that matched the rest of the bike really well. Don't see how you would retain the single out configuration, unless you plan on cutting and plating off the left side of the ball. If you have good welding skills, you might be able to get away with cutting off the connie header right before one of the cats, and welding it into the outlet as a step down behind the collector on the ZX header. But you would have to do some measuring to see if it is doable. Might be too different in diameter. I do remember a noticeable difference in throttle response when I swapped out headers and pipes though. And HOLY hell is that stock potatoe launcher heavy compared to just about ANYTHING out there. I'd stay away from that flex mesh crap. It deteriorates and gets junky. They look rusted very quickly...FUGLY. Just go aftermarket ZX14 Full Length Single Sided Exhaust. There is no 05. 06-07 is what you are wanting. Why not just remove the cats from the 09 header? Thats what I did, it made a real difference with the heat. I also wrapped the pipes. I want yo gut my 08 stock cats. How did you do it? Can you describe? Pics? Thanks much for any info you can give. I have pictures somewhere of the internals from my 09 headers, and the cats. It is NOT an easy process to remove them. THey are literally tack welded in multiple spots inside the collector. I took mine to a pro, had him cut open the collector with a plasma torch, remove the cats, and reweld the collector. Even he told me it wasn't easy. Paid him $130 for the efforts, and he said he didn't charge me enough. THis is not a DIY project unless you have the proper tools and some skill. Just saying. And I warned you. motor warms fully and the gasket seat/expand. minor issue. I'm planning to remove the header this winter and take it to jet-hot coatings, and have it dipped. Mostly for appearance and corrosion resistance, but also for heat-dissipation and better flow. i will say, that ultimately I wasn't after higher performance, but mostly a dual exhaust LOOK. I paid close to $2000 when all was said and done ( header, mods, muzzy hanger + centerstand, slip ons, etc) so be warned. Many cheaper options exist, and I didn't elect to pursue those. I am extremely happy with the results of the look, and sound, but I now need to get it tuned properly, which is going to be another hefty expense that i didn't necessarily plan on. at the time, I thought a guhl refash would suffice for my re-tune, but in talking with SISF, I know that I need to pursue a more custom tune to reach optimal performance. If you have any questions, just ask, I'll try to answer. Cats removed from 2013 header. TIG welded up inserts to keep from rattling around and then closed up by TIG welding the pieces that were cut out to expose the cats. MUCH less heat without them and alot more exhaust sound with them out. Win win. 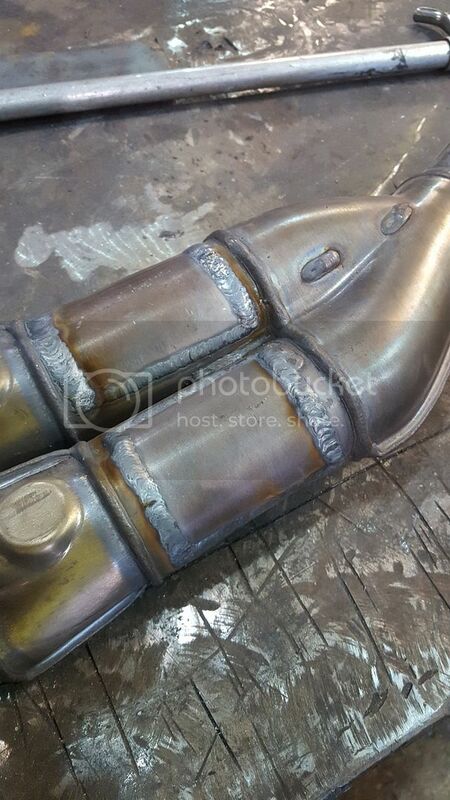 Nice pics, nice cuts, nice welds, NICE JOB! Did you retune after the surgery? If so how/what? No. Still running stock programming. For what I use it for and how I ride it's been fine. I'd be interested in SISF reflash though. What Jon did is what I want to do on my 08 over this winter. Then a reflash. My goals: 1) Remove the heat 2) Improve low end rideability. What say you about your flash with the cats gutted? Curious to how much difference you notice with stock ECU. Throttle response in different rpm ranges? This is not an especially hard task but it is dirty and requires welding skills. 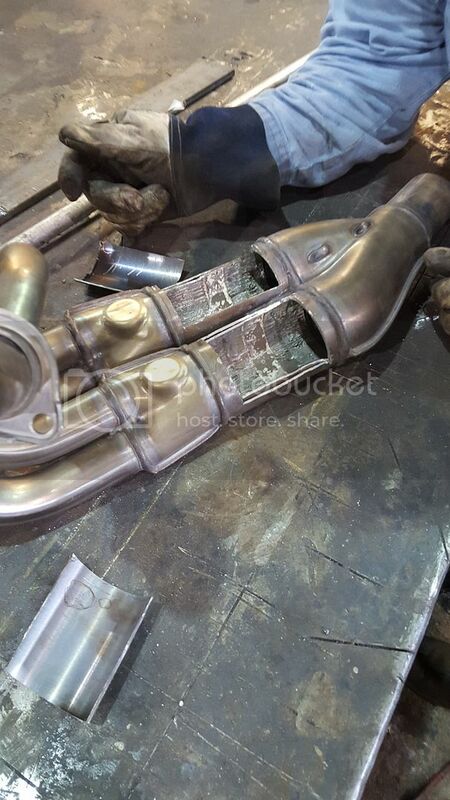 Looking at the pictures, it is much easier if you cut on or right next to the factory welds and remove slightly more than 1/2 the circumference of the pipe. When you pry out the cat do it from the side, not the end. This pipe is SS so it requires purge gas to prevent weld contamination/failure on the inside where you can not see it. I restore antique motorcycles for a living and have a fully equipped shop, including MIG/TIG/STICK and Exothermic welding as well as a complete machine shop with a 4' x 8' CNC Plasma Table. If anyone is interested in having me do this mod send me a PM. I'll give a discount to any active COG member. Air chisel....lots of small fragments. Deepsea has a valid post on the material in the cats and the welding skills required. Jon, you did a great job. very neat! I too want to know if removing the Cat had any effect? I haven't noticed much difference...C14 is still being choked down by the stock head pipes, but it runs just fine. I had a ZX-14 full system on it before doing this and it had much better pull all throughout. BUT, it had a harmonic vibration in the bike with that system on it...so I put the stock header back on with a slip-on but could not live with the heat, so the cats came out. Much happier now. I'm sure it would be improved with a proper reflash, but for what the bike is/does for me, its fine. I got a ZRX and Street Triple for making fun in the tight stuff. My compliments to whoever did the work pictured. Doing this looks to be much simpler than it actually is. Prior to removing them, I also had the TBR Juice Box, installed by the PO. About 1500 miles after removing them I sent the ECU to Don Guhl for reflashing. Working with Don was "Confidence inspiring" He gave the best customer service of any vender I have worked with in a very-very long time. I shipped the ECU overnight, Don called me the next day and we discussed my needs for the flash. I received the ECU back the next morning. Total time from removing the seat to on the road was 49 hours. And what a difference those 49 hours ( + Don Guhl ) made. My point is, removing the CATs will not give a noticable performance increase, it will however noticably lower the heat level coming from under the engine. Wrapping the pipes with hi-temp material will make an even greater differance. I have also installed a set of heat shields. Living near Sacramento means the summer heat can get extreme. It's not uncommen to be riding in 105+. I think the worst day was 113+ going through the valley and the bike handled it just fine. Page created in 0.575 seconds with 25 queries.